The volunteers and mountain crew are making great progress on the new glade up at Saddleback. Isaac and I helped out in September, and they made a big push over the Columbus day weekend. Here is a note from Peter Stein who is organizing the volunteers. I am happy to report that we actually broke through to Bee Wee Pass this weekend!!! 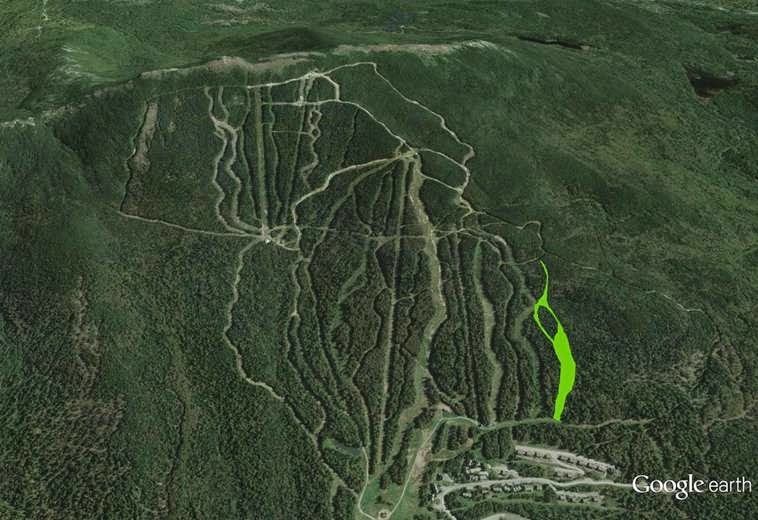 The attached shows the approximate region that is now to first order skiable thanks to all who volunteered (and a bit of help from Jared and the mountain crew!!). There was a bit more cutting by the mountain crew that I have not surveyed, and some of the line up to Bee Wee pass from the Red Devil tree island needs some thinning out. But we definitely have a new glade with an entrance and an exit all the way from Bee Wee Pass to Hudson Highway – which rivals the length of Casablanca. The wider lower part is the main glade area. The lower line leading through from the tree island on Red Devil to the main glade area is an all downhill entrance. The upper line from the tree island is a traverse with a little bit of an uphill section. The line down from Bee Wee Pass is narrow and goes through a really cool section of large boulders. Peter is also planning one more weekend of cutting. We are planning our last two days of cutting this Saturday and Sunday (18 and 19 October). There is still a lot of work we can do to make this better. This includes widening out the top of the main glade region, thinning out the top down from Bee Wee pass, creating a traverse over to the upper section that can be reached from the T-Bar, and doing a bunch of cleaning up. Please let me know if you will make it this Saturday. Unless you hear otherwise, we start at 7:30 at the bottom of the new glade on Hudson Highway. Training is still available Saturday morning for those who have not had their first day. Peter can be reached at pstein@scisol.com. It is hard work but also great fun to be creating something cool on the mountain!. This is going to be really fun to ski! Thanks to Peter, all the volunteers and Saddleback for making this happen!